Coach Brown didn’t have to become a certified EMT. But the compassion he felt towards his players, and his concern for their safety, drove him to do so. It is the same compassion that drives all EMTs – the desire to care for others in times of need. Friends say Brown has a “softspot” for the players he coaches. Brown agrees that he most definitely does. Brown wanted to be well-versed in emergency medical care so he could help players in time of need – but not any type of first-aid training would do. “I decided to train as an EMT. However, my personal schedule and limited available time outside of softball made scheduling a long-term course much too difficult,” says Coach Brown. His solution: Unitek EMT Boot Camp*. Some of Brown’s classmates entered EMT Boot Camp* nervous about the 12 to 14 hour days – information overload or lack of sleep. “I can say without reservation that this did not happen,” says Brown. Instead, EMT Boot Camp* was 14 consecutive days of excitement, engagement, and all-things-EMT. After graduating from Unitek EMT Boot Camp*, Brown says he “sees things in a different light.” He assesses situations, spotting potential dangers; and if something does happen, he feels confident in his ability to respond effectively. Boot Camp* Graduate, and now certified EMT, Coach Brown embodies the Unitek motto of “going beyond the call of duty”. 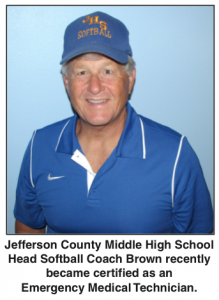 Coach Brown went beyond what was required of him as a coach, and made himself an invaluable asset to the Jefferson County community.